"Any time someone asks the question, 'What exactly is soul food?' the answer should always be 'a comforting bowl of red beans and rice.' Just sit them down, give them a spoon, and when they finish, ask them if they understand. They will." Place beans in a large container and cover with several inches of cool water; let stand 8 hours to overnight. Drain and rinse. Heat vegetable oil in a large pot over medium heat. Cook and stir sausage in hot oil until oils slightly release from sausage and edges brown, 5 to 7 minutes. Stir onion, celery, and poblano pepper into sausage; cook and stir until vegetables soften and start to turn translucent, 5 to 10 minutes. Stir garlic into sausage mixture; cook and stir until fragrant, about 1 minute. Stir red beans, chicken broth, ham hock, bay leaves, black pepper, thyme, cayenne pepper, and hot sauce into the sausage mixture; bring to a boil, reduce heat to low, and simmer gently, stirring occasionally, for 1 1/2 hours. Add salt and continue simmering until beans are soft, meat is tender, and desired consistency is reached, 1 1/2 to 2 hours more. Season with salt. Spoon rice into bowls, ladle red beans mixture over rice, and top with green onion. You can substitute green bell peppers for the poblano pepper, if desired. You can use water in place of chicken broth, if desired. 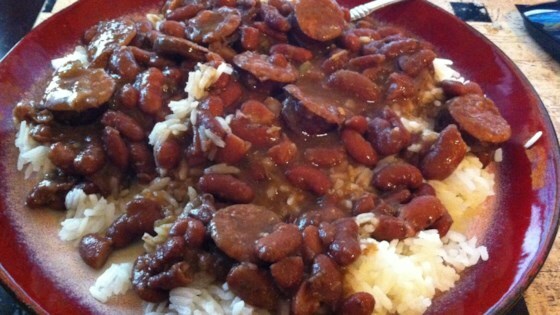 I'm from New Orleans and really don't use a recipe when I make red beans. But since I love Chef John, I wanted to try his way. Outstandingly delicious!